High performance sport competitors invest a lot of time and effort in their training and game strategy to become winners. Their success depends on a combination of factors such as speed, physical abilities and training programs, but more importantly, it depends on their strategy. SAP has taken advantage of this niche market and has built software that helps coaches and athletes to do better planning. 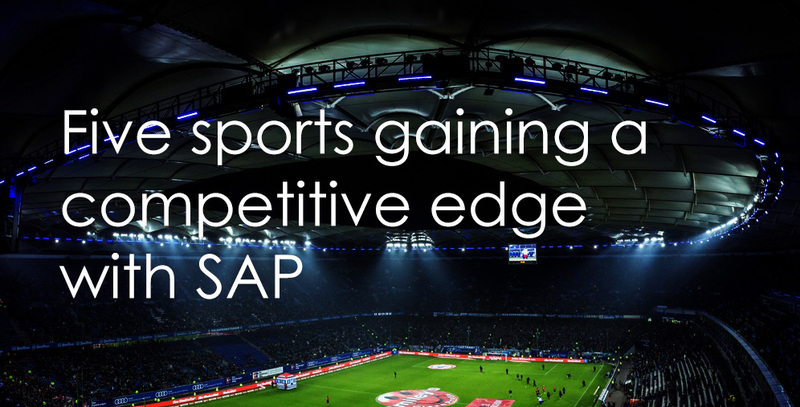 As a result, sports organisations are now adding SAP HANA Cloud technology to their strategy mix, making sports even more competitive. FC Astoria Walldorf, FC Bayern-Munich and even the German national football team are examples of football organisations that adopted the SAP HANA Cloud to improve their operations, ticketing service and fans experience. As part of the SAP integration, they also manage their teams’ performance via the SAP Sports One Solution, software that includes applications for all the roles within the club including team management, training planning, match analysis, performance diagnostics, player fitness, and scouting data. SAP Sports One includes the SAP Team One mobile app which facilitates internal communication and that is fully integrated with all other applications of SAP Sports One. The Women’s Tennis Association, organiser of the WTA Tour – the worldwide professional tennis tour for women and whose competitive season includes 54 events – has introduced the use of SAP Tennis Analytics for Coaches during their tournaments. This SAP solution was built for the WTA and functions like a coach assistant: it analyses trends during a match and enables the coach to optimize their strategy and provide key instructions to the player that could impact their chances of winning a match or championship. US Sailing is an American organisation that promotes sailing by providing training and certification to sailors of all ages and abilities. US Sailing has adopted SAP systems throughout their organisation since 2006, and uses SAP Sailing Analytics Solution as a tool to calculate racing results and other performance data post-racing, with the aim to increase participation. They are able to do this through the SAP Sail InSight app, which records GPS paths. As the app is available for iPhone, iPad and Android phones, it enables all sailors to record their results anytime and anywhere. McLaren Group, the British Formula 1 team and automotive company, is using SAP HANA to win races by analysing a combination of historical and real-time data and making decisions based on strategies that worked in the past in similar situations, all in a fraction of a second. The German ice hockey club and seven-time German Championship winner, uses SAP Sports One to plan and record the training and fitness of their team members, allowing coaches to identify their different strengths and monitor their performance. This not only enables them to build strategies but also to take decisions in regards to players’ promotions. The App is powered by the SAP HANA Cloud and also has the ability to record their medical history including any injuries, recovery plans and medication. Do you want to know more? Learn how other sports and entertainment organisations are using SAP apps to improve their fans’ experience.